We’re a music society comprising four sections: a large mixed-voice Choir, an Orchestra, a Concert Band and KEMS Contemporary. (See links on left). Our friendly members, who cover a wide age range, have one thing in common: we take making music very seriously, always striving for the best possible performances. 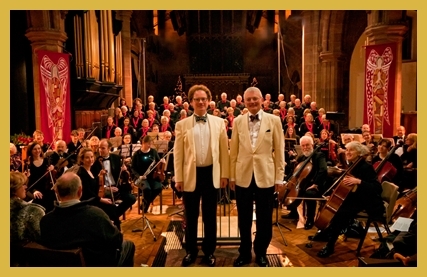 The Society celebrated its Golden Jubilee in 2006-7 with a performance of Verdi's Requiem at the Royal Northern College of Music in Manchester. In 2017, the Society celebrated its 60th anniversary with a concert at the Royal Northern College of Music featuring KEMS, Choir, KEMS Orchestra, KEMS Concert Band and the newly formed KEMS Contemporary. The standard annual subscription covers the cost of joining the Choir, Orchestra, Concert Band or KEMS Contemporary. Subscription covers the cost of all music hire and costs associated with mounting concerts. In addition to our standard season we organise a number of optional extra events and performing opportunities (some of which incur an additional charge) including a day-long workshop and a programme of summer chamber music groups. We are always delighted to hear from singers and instrumentalists who would like to become members of our KEMS community. The annual membership fee for a single section - KEMS Choir, KEMS Orchestra or KEMS Concert Band - is £95. If you would like to be a member of two or more sections, the annual fee is £150. To download our Membership Application Form, click Here. Most members find that the most convenient way of paying is by using our Bankers Order Form. KEMS is particularly keen to attract student members. If you are under 26 years of age, membership of KEMS is FREE. Please e-mail our Chairman Scott Thomson or our Treasurer Paul Spedding if you would like to know more. (in association with Macclesfield Youth & Community Programme Cre8). Additional events will appear on this page as details become available.